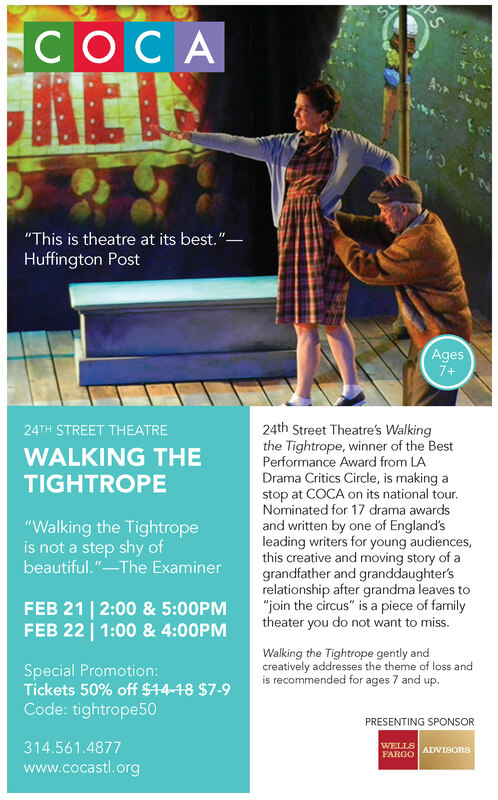 COCA presents “Walking the Tightrope” in the Founders’ Theatre February 21 and 22, 2015. 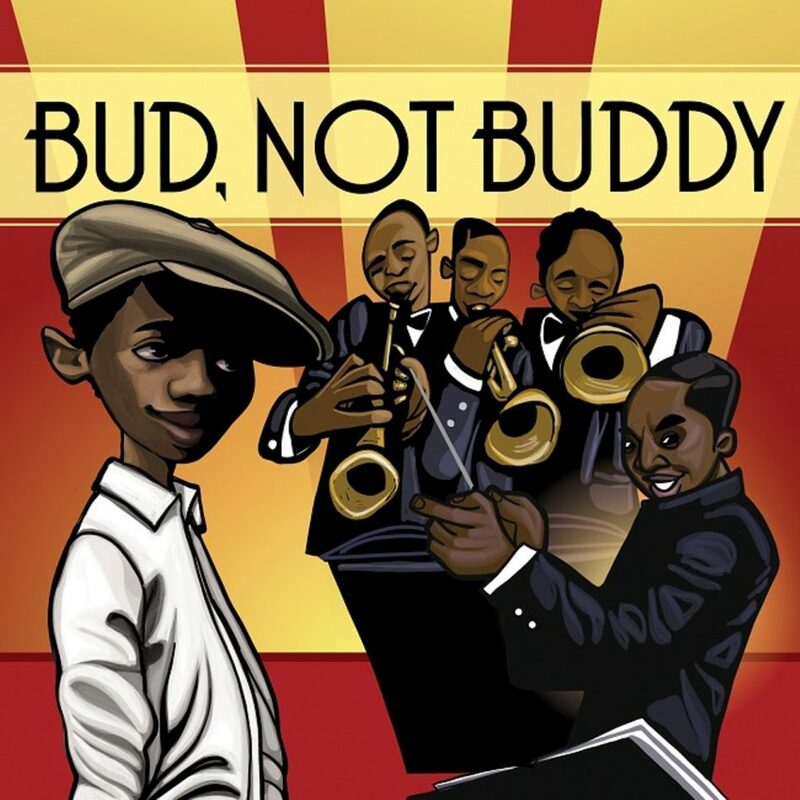 Winner of three LA Drama Critics Circle Awards and honored with more than a dozen nominations for acting, music, video design, and more, this production is an experience adults and children can enjoy together. 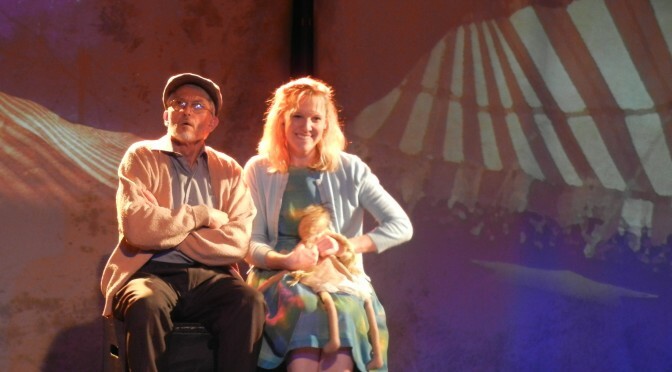 Written by Mike Kenny, one of England’s leading writers for young audiences, and produced by 24th STreet Theatre in Los Angeles, “Walking the Tightrope” is a sweet, funny, and moving story of a grandfather who tries to tell his 5 year-old granddaughter that Grandma is gone, and in the process builds a beautiful new relationship with her. With the help of a single clown, they discover the meaning of family. 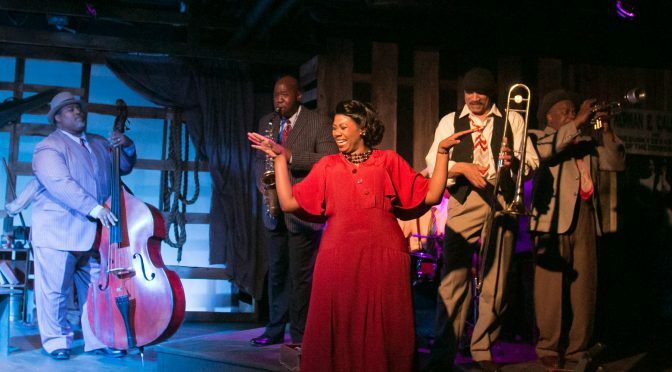 24th STreet Theatre’s acclaimed production uses world-class acting, sophisticated video, sound design, and original music to transport audiences from Grandad’s quaint 1959 English seaside cottage to the spectacular big top of circus. Look below for a special half off ticket promotion! 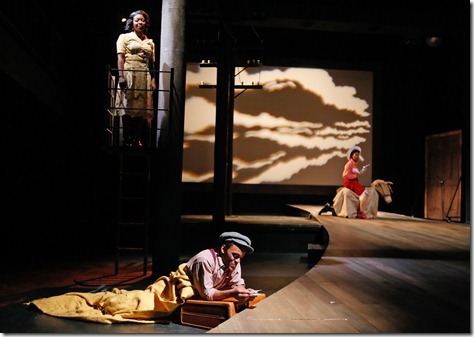 PARENTAL GUIDANCE: “Walking the Tightrope” gently and creatively addresses the theme of loss and is recommended for ages 7 and up. Run time is approximately one hour. General seating tickets are $14-$18 online or by phone at 314.561.4877, or in person at COCA. SPECIAL PROMOTION for Culture Mama readers! 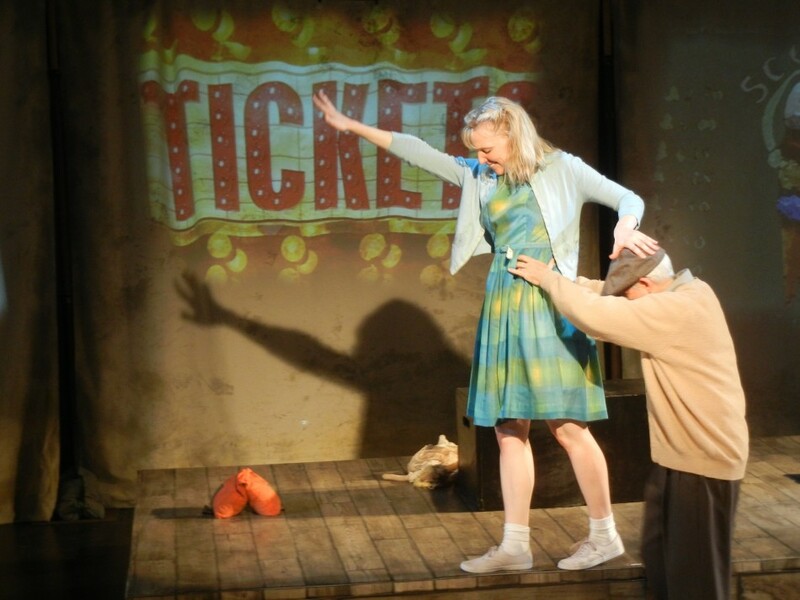 Take 50% off any ticket with the promo code: tightrope50. Be sure to enter this code in the promo code box at the top right hand side of the screen when ordering online or tell a COCA staff person when calling or buying tickets in person. The Missouri Humanities Council, First Bank, and Whole Foods Market, with Ready Readers and the Imaginary Theatre Company present “The Tortoise and the Hare” on Sunday, January 26, 2014, 1 to 3:30 pm, Clayton High School Commons, 1 Mark Twain Circle, Clayton. Starting at 1 pm, children ages 3 to 10, can participate in fun interactive activities, face painting, a magician, clowns, and more. 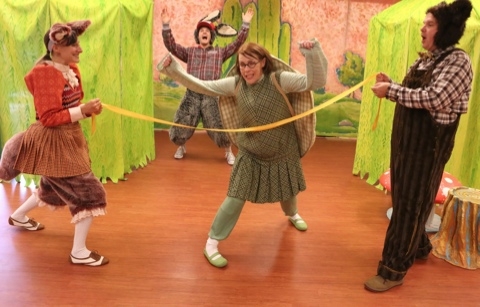 The performance of “The Tortoise and the Hare” begins at 2:30 pm. Tickets are $12 per person in advance and $15 per person at the door. Purchase your tickets securely online. For group reservations, contact Lisa Greening at lisa@readyreaders.org. Questions? Call 314.564.8070. One of Aesop’s fables springs to life in this fun new musical adaptation. Henry is a racer, one of the fastest bunnies the forest has ever seen. Shelly’s a tortoise, his quietly devoted best friend. Henry has always been the star of the show, until one day Shelly starts to have some dreams of her own. With the help of their forest friends, Shelly realizes her own worth and Henry finds out that sometimes being the best is not the most important thing. Run time is approximately 45 minutes. 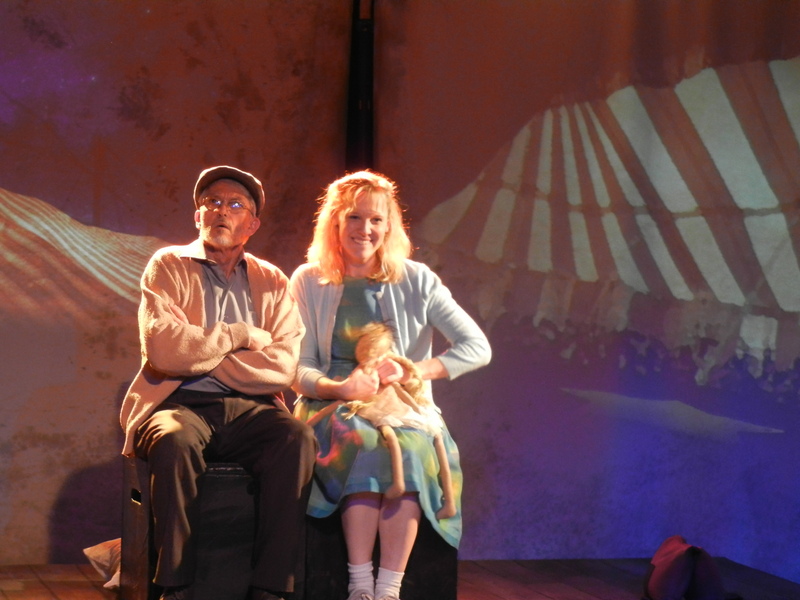 See photos from the production! 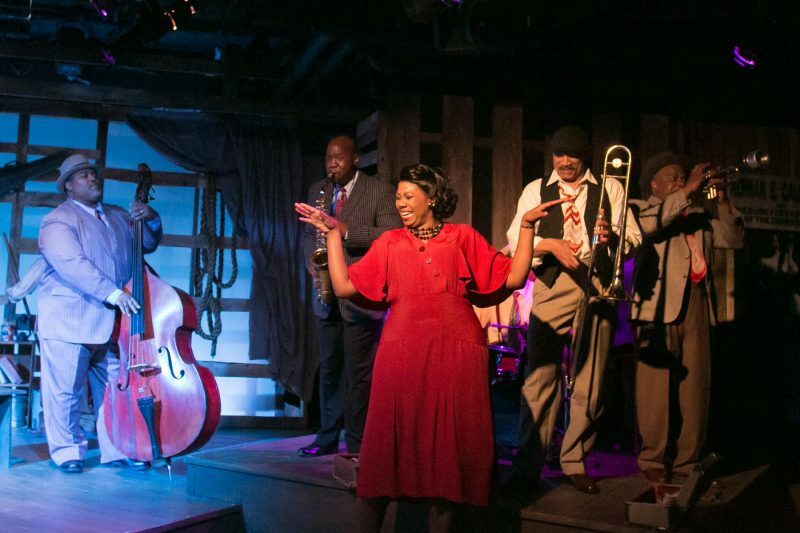 The Imaginary Theatre Company (ITC) is the resident, professional, touring ensemble of The Repertory Theatre of St. Louis. Through the use of literature, folk tales, fairy tales, and new adaptations of classic works, ITC is committed to providing the very finest in theater for young audiences and strives to bring quality performances to schools and community venues throughout the bi-state area.